The first railroad in the Columbia River Basin was built along the river in 1851. Little more than a cart on rails, it was a portage tramway on the Washington side of the Columbia River Gorge around The Cascades rapids. With a mule and one cart, Hardin Chenoweth moved freight and passengers around the rapids for a fee of 75 cents per 100 pounds. In 1894, the little railroad was damaged by flooding and sold to a cannery, which used it to haul salmon from its fish wheels to its production building. By 1862 railroad portages were operating on both shores of the Columbia at The Cascades rapids, making passage much easier for settlers arriving from the East. In this year, the Oregon Steam Navigation Company gained control of portage roads and equipment on the Oregon side, securing its monopoly on river transportation. The following year, 1863, work was completed on a portage railroad around The Dalles and Celilo Falls about 40 miles upstream of The Cascades. Called the Dalles and Celilo Railroad, its first locomotive was named after John C. Ainsworth of the Oregon Steam Navigation Company, which owned the railroad. From these beginnings as portage conveyances, railroads quickly were built to connect steamboat landings to cities and cities to the rest of the country. Emigrants were pouring into the Northwest, lured by the promise of donation land claims or the prospect of riches from the mines. It was also a time that America sought to increase its foreign trade. In 1845, Asa Whitney, a New York businessman, had proposed to Congress that a transcontinental railroad be built from Lake Superior to Puget Sound to facilitate the growing trade with China. The reaction in Congress was cool initially, but Whitney was skilled at building popular support for seemingly far-fetched ideas, and the transcontinental railroad gradually took hold in the imagination of the American public. Railroads at the time were mostly experimental, and few were longer than 150 miles. In 1853, just two years after Chenoweth completed his portage railroad, Congress approved funding for the Topographical Corps to survey possible railroad routes from the eastern states to the Pacific Ocean. Isaac I. Stevens, the new governor of Washington Territory, was appointed to lead the northern survey. Five routes were surveyed; the resulting reports were published 1856 and 1861, and Congress deadlocked on whether to authorize a northern or southern route. The Civil War broke the deadlock, and in 1864 Congress chartered the Northern Pacific Railroad. Because of the high cost of the Civil War, the government was not able to provide a cash subsidy for each mile of track laid. Instead, Congress provided the Northern Pacific the largest land grant in American history — 60 million acres from Lake Superior to the Pacific, a vast checkerboard of alternating one-mile squares of land along the route of the railroad. Congress also required the railroad to be completed by July 4, 1876, which proved impossible. Ultimately, the Northern Pacific had to give back some of the land for noncompliance with the terms of the grant, but the company still ended up with nearly 40 million acres, more than twice as much land as any other railroad received. The Northern Pacific line passed through the Columbia Basin region of Eastern Washington and was completed between Spokane and Pasco in 1881. Meanwhile, the first railroad built in the Interior Columbia Basin was completed in 1875, a 28-mile narrow-gauge line that connected Walla Walla with the Columbia River near the mouth of the Walla Walla River. It was built by a Walla Walla businessman, Dr. Dorsey Baker, to connect Walla Walla with the Columbia River and riverboat traffic to Portland. The western terminus was at Wallula, at the mouth of the Walla Walla River. The region was growing, its economy was expanding, and soon the Northwest would be linked to the rest of the nation by railroads. The Northern Pacific was the first to link Portland with the Midwest and East. The ceremonial completion of the railroad was on September 8, 1883, when Northern Pacific President Henry Villard drove a golden spike at Gold Creek, later known as Independence Creek, 60 miles west of Helena, Montana. Other transcontinental lines soon followed. In 1884, the Oregon Short Line completed its track from the Union Pacific junction at Granger, Wyoming, through the Snake River Valley to a junction with the Oregon Railway and Navigation Company tracks at Huntington, Oregon, opening another transcontinental route to Portland. In 1885 the Canadian Pacific transcontinental line was completed at Craigellachie, British Columbia, a few miles west of Revelstoke, thus linking Montreal to the Pacific coast at Vancouver through the Columbia River communities of Golden (where the river flows north) and Revelstoke (west across the Selkirk Mountains where the river flows south). The Southern Pacific was completed at Ashland, Oregon in 1887, linking Portland with San Francisco and other cities as far away as New Orleans. In 1891, a line was completed between Vancouver and Seattle. James J. Hill completed his Great Northern Railway track between St. Paul, Minnesota, and Everett, Washington, in 1893. Finally, in 1909 the Chicago, Milwaukee & St. Paul was completed, linking Chicago with Tacoma and Seattle. Transcontinental railroads, like the wagon trains of the Oregon Trail, brought waves of population to the Pacific Northwest and helped shape whole communities in the Columbia River Basin, both in the United States and in British Columbia. Almost immediately upon completion, the railroads began recruiting emigrants to the Northwest. Railroads were expensive to build and operate. They needed passengers, freight and income, and their publicity staffs worked hard to entice people to travel to the Northwest and settle in cities and on farms — and, of course, rely on the railroads for goods and services. The journey to the promised land that took months by covered wagon in the 1840s could be completed in a week or so by the last decade of the 19th century. Largely as a result of the completion of the transcontinental lines, population in Idaho, Washington and Oregon jumped from about 251,000 in 1880 to 705,000 in 1890. Northwest Indians also were viewed with suspicion and, in some cases, outright derision. The Northern Pacific reported to its shareholders in 1884 that the Coeur d’Alene, Yakama and Puyallup Indian reservations were embarrassments to the company and prevented settlement of nearby lands. In 1907, a pamphlet prepared by the Milwaukee Road declared that “one by one, the Indian reservations are being turned over to the settlers who can till the ground intelligently.” The company published “homeseekers’ round-trip fares” to Missoula, Spokane and Coeur d’Alene for the purpose of settling on Indian reservations. Historian Carlos Schwantes of the University of Missouri, St. Louis, writes that it is not possible to know how many settlers the various promotional pamphlets and exhibits attracted to the Northwest, but the region’s political and business leaders certainly believed they did the job. More than 30,000 people emigrated to Oregon between 1874 and 1877, according to records of the Oregon Steamship Company, Schwantes notes, and it could hardly be coincidental that subsequent waves of immigration during the first two decades of the 20th century coincided with massive railroad promotional campaigns. 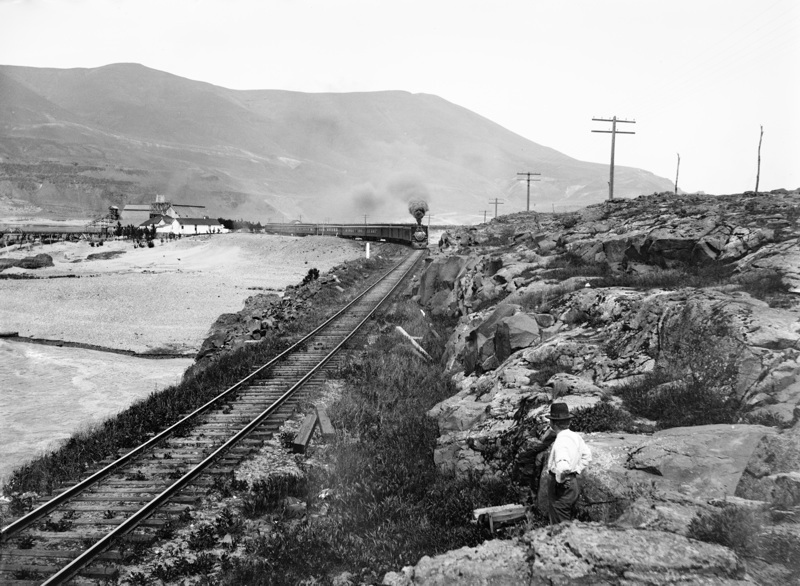 A westbound train rounds a bend on the Oregon shore of the Columbia east of Celilo Falls in this photo, probably taken around 1900. Photo: Historic Photo Archive, Portland.